Get some cultural insight at Unfinished Temple de la Preciosa Sangre and Zona Romantica. Popular historic sites such as El Faro Lighthouse and Old Vallarta are in your itinerary. 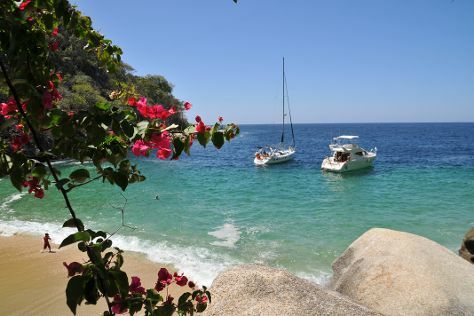 Explore Puerto Vallarta's surroundings by going to Yelapa (Yelapa English Spanish Institute & Parasailing & Paragliding), Mascota (Museo Arqueologico & Casa de las piedras) and La Penita de Jaltemba (Hamaca Maya & La Penita Tiangui). Spend the 30th (Sat) exploring nature at Isla Marietas National Park. Spend the 21st (Tue) with some fine spirits on a distillery tour. The adventure continues: take a stroll through Olas Altas, stroll through Platanitos Playa Beach, get outside with Bahía de Banderas, and find your balance on the water with some of the best stand-up paddleboarding in the area. To see more things to do, where to stay, other places to visit, and more tourist information, use the Puerto Vallarta vacation trip planner. If you are flying in from Canada, the closest major airport is Licenciado Gustavo Díaz Ordaz International Airport. September in Puerto Vallarta sees daily highs of 36°C and lows of 28°C at night. Wrap up your sightseeing on the 23rd (Thu) early enough to travel back home.